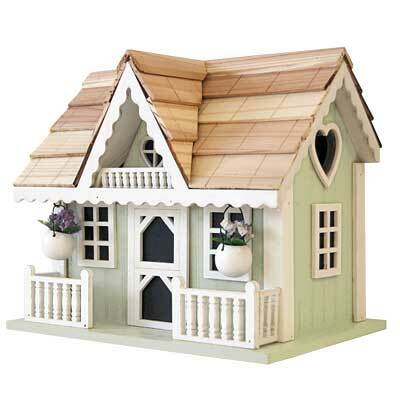 Create a tranquil and beautiful retreat for songbirds by adding this Home Bazaar Rosemary Cottage Bird House to your landscaping. Soft green and vivid white hues throughout the shelter bring a serene look to your yard, while faux purple flowers in miniature hanging baskets mimic rosemary blooms. A pitched roof with a front gable adds an architectural element to the piece, enhanced by a picket fence, upper balcony, and gingerbread trim. A 1.125" tall and 1.125" wide, heart shaped entry sits on one side of the abode, perfectly matching the faux window beneath the gable. The spacious interior provides plenty of room for a wren or chickadee nest, and a ladder beneath the entry allows fledglings to reach it. Two drainage holes on the flat base of the unit help water exit, and a removable panel on the back makes nest checks simple. Swing the hanging tab upward to place this item on a tree or wall, or attach a mounting plate (not included) to the base for displaying it on a pole or post. The ornate exterior will certainly capture attention, while the wooden body adds a natural hint. Show your backyard birds how much you love them by placing this Rosemary Cottage Bird House in your garden. Note: Climate and the elements will weather the home and change its appearance over time; however, weathering will add to the item's natural charm without compromising its function. Should you want to preserve the finish (paint) of this house, it is recommended to cover it with a polyurethane product that is recommended for marine use (UV Rated) that will not turn the white paint yellow. You should expect that once left outside, the home will weather and require refinishing. Erva Birding Pole with Ground Auger, 6' 8"H x 1" O.D.